I'm used to making popovers in a popover pan, which, for those that are unfamiliar, looks much like a muffin pan but has much deeper wells so the popovers can rise. The popovers I know are much like Yorkshire pudding, or hollow rolls that are muffin shaped and are primarily egg based. They take quite a while to cook and bake at two different temperatures that results in an amazing crisp outside and a doughy yet hollow inside. Yum. When I saw a recipe for a single popover cooked in a pan I thought to myself, that's too easy! I decided to take the recipe for a spin and of course had to adapt it a bit. The result was something unlike the Yorkshire pudding-like popovers I am used to and are more like a breakfast dish I call German pancakes (which are in fact, not German at all). The single-pan apple popover still rose but was more dense than its traditional counterpart. Don't get me wrong, it's still scrumptious and satisfies a sweet tooth, just completely different than a traditional popover! Slice the apples into 1/4 inch slices. 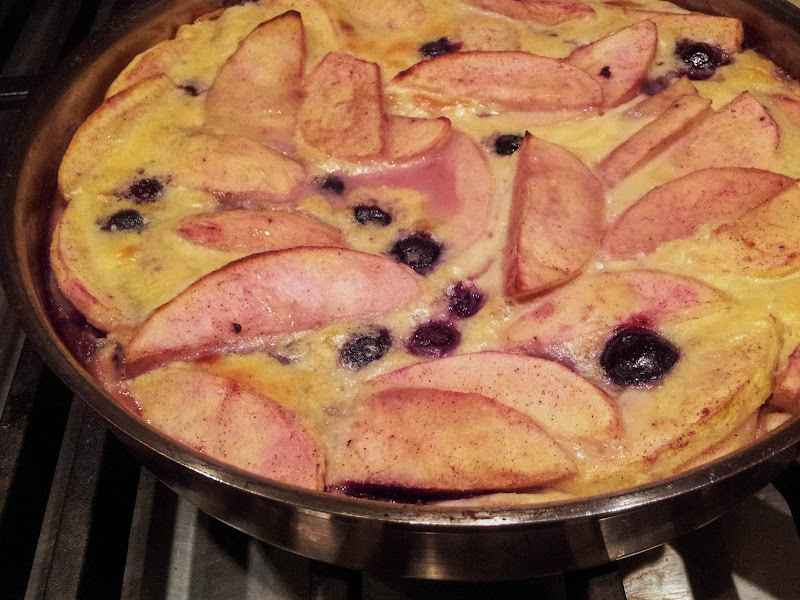 On a stove top, heat the butter in an 8-9 inch oven-safe pan and add the apples, blueberries, honey, and cinnamon. Mix well and cook until the apples are just soft and remove from heat. In a bowl, beat the eggs and add the milk, butter, vanilla, and honey. Add the flour and mix until completely smooth. Pour over the fruit mixture in the pan and place on a middle rack in the oven. Bake for about 20 minutes. Do not open the oven at any point in baking as the popover may collapse. You should see parts of the egg mixture begin to rise and turn golden. If the fruits are particularly watery, this may not happen, however, the mixture may begin to pull away from the sides of the pan and at this point, your popover will be near done. Remove the pan from the oven and serve immediately. The popover is great with some dusted confectioners sugar, whipped cream, or yogurt. Note: If the butter you use is unsalted, you may choose to add a pinch of salt. You can substitute the honey for sugar or any other sweetener you'd like. Whoops! This is totally a camera phone photo. When making a gigantic popover at 10 PM, there really isn't anything left in you to go pull out the DSLR.